We have previously identified and characterized the phenomenon of ectopic human centromeres, known as neocentromeres. Human neocentromeres form epigenetically at euchromatic chromosomal sites and are structurally and functionally similar to normal human centromeres. Recent studies have indicated that neocentromere formation provides a major mechanism for centromere repositioning, karyotype evolution, and speciation. Using a marker chromosome mardel(10) containing a neocentromere formed at the normal chromosomal 10q25 region, we have previously mapped a 330-kb CENP-A-binding domain and described an increased prevalence of L1 retrotransposons in the underlying DNA sequences of the CENP-A-binding clusters. Here, we investigated the potential role of the L1 retrotransposons in the regulation of neocentromere activity. Determination of the transcriptional activity of a panel of full-length L1s (FL-L1s) across a 6-Mb region spanning the 10q25 neocentromere chromatin identified one of the FL-L1 retrotransposons, designated FL-L1b and residing centrally within the CENP-A-binding clusters, to be transcriptionally active. We demonstrated the direct incorporation of the FL-L1b RNA transcripts into the CENP-A-associated chromatin. RNAi-mediated knockdown of the FL-L1b RNA transcripts led to a reduction in CENP-A binding and an impaired mitotic function of the 10q25 neocentromere. 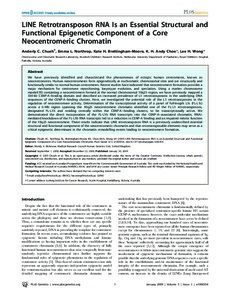 These results indicate that LINE retrotransposon RNA is a previously undescribed essential structural and functional component of the neocentromeric chromatin and that retrotransposable elements may serve as a critical epigenetic determinant in the chromatin remodelling events leading to neocentromere formation.